The first three live-action "Spider-Man" films in one Blu-Ray set! Spider-Man 2 (2004): Finally, a live-action Spider-Man show where we can see him fight Dr. Octopus! Doc Ock was always my favorite Spidey villain. He's played by Alfred Molina who does an OUTSTANDING JOB! He has the look of Dr. Octopus, but even better he gives the character more depth than just a raving lunatic. In the comics, I think Doc's robotic tentacles are about eight feet long. In this movie, they stretched much farther. I believe over twenty feet at times. Impressive, indeed. The whole cast is good...again! Tobey Macguire makes a pretty good Spider-Man. My only complaint about this movie is pretty much the same that I had for the first film: at times it's just too depressing. This film can depress you more than the first because more bad things happen to Spider-Man. Mary Jane is about to marry Peter's best friend Harry Osborne. Harry is becoming a drunken lunatic with an obsession for killing Spider-Man. Aunt May gets evicted from her house. Spidey gradually loses his powers due to stress and ultimately gives up being Spider-Man (for a little while). Peter Parker (Spidey) loses his job(s) and gets poor grades in college. Basically, everything in Spider-Man's life falls apart and he just keeps getting dumped on for most of the picture. Plus all the love tension between him and Mary Jane doesn't make things any better. By the end of the movie, though, everything gets better, but man...how frustrating! This definitely isn't a "feel good" movie. There was so much downer stuff that I was starting to wonder when Dr. Octopus was going to come on the screen again. Thankfully, Dr. Octopus as played by Alfred Molina and all the spectacular action really carry this movie and make it worth watching! For sheer spectacle, you HAVE to see this film! By the end of the movie, Peter Parker and Mary Jane finally become an item so hopefully we won't have to see anymore of that in the next film. I think it's time new challenges arise in Peter Parker/Spider-Man's life. They dwelled a little too much on things that they already covered in the first film. Hopefully, Spider-Man 3 will be a little more uplifting. 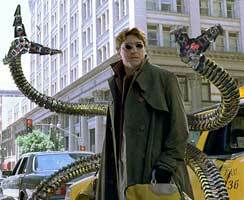 And if they bring back Dr. Octopus in the next film or sometime again in this movie series...that would be good, too!